SnoreEzzz is a snoring reduction pillow. It was created by a woman whose husband kept the whole family up at night with his snoring. The pillow is made of a special type of foam that cradles the head and neck in a position that prevents snoring. The exterior is made of soft and comfortable cotton. The materials used in the pillows are hypoallergenic so everyone can use it. It is also washable and did not seem to degrade or shrink after the 5 washes we gave it when testing it. The pillow comes with a 5-year warranty. 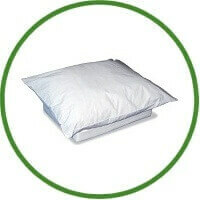 The pillow prevents the common neck problems which arise with other pillows. The SnoreEzzz solves this by a 2-stage design. The base is slightly heavier and keeps it shape well while the upper part is soft and feels like down. When combined, it is both comfortable and keeps your head in the optimal sleeping position, thereby lessening snoring. We give the SnoreEzzz 5/5 stars for comfort, usability, price and effect. SnoreEzzz Pillow Review – Does It Really Help? There are many people in the world today that suffer from a problem that, at times, can be life threatening, although is generally more of a nuisance than anything else. It is something that can leave you fatigued, even after a good night’s sleep, and it is something that can cause immense tension within a marriage or partnership. This problem is snoring. Although, there are a great many professed solutions to snoring in the world today, some are more effective than others, and sometimes it can be hard to know which is best. With this in mind, to know which kind of snoring remedy works best, perhaps it is best to first learn what, exactly, causes snoring? Snoring is caused by a narrowing of the throat, which causes the victim to try to force air through the narrow orifice, which in turn causes the flesh of the throat to vibrate. This vibration is what you know as snoring. As said above, snoring is mostly just an irritation, and does nothing but drive the people around you crazy. However, sometimes it can be a symptom of a much more serious problem called sleep apnoea. Sleep apnoea is when you stop breathing during the night due to the difficulty in getting air. Because of this, your body wakes up temporarily to start breathing properly again, before falling back to sleep and starting the process all over. This is a serious condition that should always be seen by a medical professional. One of the most popular types of snoring cures is a special pillow, such as that of Snoreezzz pillow. These stop snoring pillows profess to work by stationing the head and neck in such a way that it reduces the stress inside the throat, opening the airway more, which in turn should help to prevent snoring. Let’s see if it really works. As stated, when there is a narrowing of the throat, it ends up vibrating due to the force of drawing in air. When you position your head in a certain position, the airways open up to their maximum capacity which means that the vibrating will be relieved, at least somewhat. This is the same thing that CPR practitioners will do to their victims, positioning the head properly to allow entry of the air down their throat. Ultimately, though, snoring is often caused by other culprits, such as problems in the nose, and certain organs in the throat that are larger than they should be. As well, this pillow may work for some people who like to sleep on their back (a major cause of snoring as well), but for those who prefer to sleep on their sides, this pillow may not be the solution that you are looking for. The efficacy of the SnoreEzz may also depend on how much flesh you have inside your throat, as overweight individuals tend to snore much more due to excess fat in the airways. It is, however, a very cheap solution! So give it a try and see if it works for you. The snoreEzzz Snore Reduction Pillow is FDA-approved and proven to reduce snoring and increase comfort while you sleep. It features a two pillow design which adjusts your back and neck to align your spine so you can finally get the snore free sleep you want. The snoreEzzz Anti Snore Pillow is available in Standard, Queen and King sizes. How Well Did It Stop Snoring? The pillow does the job for us. My husband rarely snores now and it has really helped with my sleep. We are really happy with the construction. The foam supports the back of the neck. I went back to order a pillow for ourselves and pillowcase. The pillow is well made. Clearly, someone had done some solid research on in order to develop the finished product. I have tried many products over the years, but hands down, this was one of the best snoring remedies I have ever used and probably the last I will need. What a help it has been for a restful night’s sleep! The pillow is well constructed and not only helps with my snoring, but has helped my scoliosis too. It’s the perfect size for my tossing and turning; and I just love the softness of the pillow case. This product accomplishes what it claims. It is a good snoring treatment and very comfortable. I was unconvinced that a pillow could stop snoring at the beginning but I can tell you that it really works and it helped me (and my girl). It works great for snoring and even just as a regular pillow. The only complaint is that it can be hard to put your arms under it but it is a great anti snoring devices. Purchasing a SnoreEzzz pillow might not magically get rid of snoring, but it can make an improvement and reduce the frequency with which a person snores. It does not work for everyone, and sometimes people snore due to certain conditions that cannot be resolved simply by changing the pillow. The SnoreEzzz is generally favoured positively by those who have chosen to purchase it. One of the benefits offered by the pillow is that it can be used from a variety of different positions. Side-sleepers can still get a comfortable night’s sleep through the use of the SnoreEzzz. If you are interested in purchasing an anti-snoring pillow, you should know that it is usually sold at a reasonable price. In any case, you might want to consider reading up on the subject a little more and checking out other reviews related to the SnoreEzzz before deciding to make a purchase. This will help to give you a good idea of whether or not it would be a worthwhile investment. As you can see, the pillow prevents the common neck problems which arise with other pillows. The SnoreEzzz solves this by a 2-stage design. The base is slightly heavier and keeps it shape well while the upper part is soft and feels like down. When combined, it is both comfortable and keeps your head in the optimal sleeping position, thereby lessening snoring. We give the SnoreEzzz 5/5 stars for comfort, usability, price and effect.